A mother called me last week to tell me about her middle-school daughter. I guess because I was a teacher for so long and write education articles, people tend to turn to me with their concerns. The mother (I will call her “Annie”) said her daughter (“Suzie”) went to a Harmony School in XXXXX, Texas. Annie thought the schools would be good because they advertised their well-disciplined approach and high science and math scores. Annie allowed her daughter to remain in the school for a year but became very concerned as the school year progressed. Annie described the Harmony School as being decorated all in Turkish furnishings, wall hangings, memorabilia. Many of the students were Muslims, Pakistanis, Turks, Asians, etc. Low-income Afro-American and Hispanic students also went there. Suzie is dark-skinned, and that is one reason Annie thought her daughter would fit in well at Harmony. Annie said there were four American teachers who spoke good English; the rest were Turks who came from Albania. The e-mails that Annie received from the school were written in such broken English that she could hardly understand the content. Suzie received almost no instruction on English grammar/usage, and her ability to write in good English decreased in proficiency while she was there. Students had uniforms and T-shirts from Turkey. The school held cooking classes for parents and taught them Turkish recipes. Trips to Turkey were advertised early in the year, and students and other people went on these trips for a two-week spring break. If students could not afford the trips, they were provided the money to go. The summer trip to Turkey was for one month. Students participated in the Science Olympiad that was held within the Cosmos Foundation across the United States — Cosmos students competed with other Cosmos students. 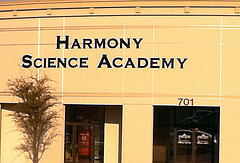 The Harmony students took very frequent field trips during the school year and constantly put their students on display. They almost always went to places and had luncheons where elected officials could see them and did frequent performances for Congressmen, state board of education members, Texas legislators, city councils, judges, police chiefs, fire chiefs, etc. The mother said Suzie received overly generous grades the whole time that she was in Harmony and that students whom Suzie knew were mediocre students also received inflated grades. In January students who had received F’s for the first semester were bumped up to B’s. To prepare the students for the TAKS, Suzie told her mother that they were drilled on dates(e.g., 1492), but there was no explanation or teaching about the historical background of such dates. When they were taught history, they studied such things as a story about a Japanese (or Chinese) man who lived in California and invented “the first airplane.” Nothing was ever taught about the Wright Brothers. Multicultural historical figures were emphasized, but the Founding Fathers had little if anything said about them. There were three mentions of Paul Revere in a textbook, but they were short sentences. The students did read a book that was supposed to be about Paul Revere and the historical figures of the time but ended up being a book about the female author. The books were dry, unengaging, and contained no traditional history with stories of American heroes and heroines. Suzie did have textbooks, but the literary selections were about dark, depressing, negative,and disturbing subjects that referenced America with frequent examples of drugs, alcohol, and violence. Suzie and her mother both felt the literary selections did not represent wholesome American life. Because Suzie became increasingly depressed while attending Harmony, Annie decided to remove her from the school after a year. What we need to remember is (1) nobody monitors these Harmony Schools during the administration of tests. What is to prevent these H-1 visa teachers who are from Turkey and who have no commitment to the American value system to give their students the answers? (2) The Wikileaks cable from theU. S. Ambassador several years ago revealed that the Gulenists are taking over the Turkish Security Forces by giving applicants the answers to the tests. If this is their mode of operation in Turkey, it very well could be the way they operate here. (3) Dr. Ed Fuller’s research showed that over half of the students who start at Harmony leave. This would certainly be a major factor in raising their TAKS scores — weed out the weak students. A friend wrote to me a few weeks ago and told me of an incident at Indian Springs Park in Waco, Texas. The Harmony Science Academystudents from Waco performed at a community art festival. As reported by my friend, the students were dressed in their attractive Turkish costumes and were waving bright-colored Turkish flags. The audience was impressed with the students’ graceful movements as they flourished their Turkish flags throughout the dance; but at one point, the students took a large American flag, put it on the stage floor, and began to dance upon the flag. When the members of the audience realized that the students were treading upon our nation’s flag, various people rose to their feet to object to this lack of respect. The dance finished up about that time, and the children hurriedly left the stage. My friend said she felt the incident demonstrated that there is a type of subtle, anti-American indoctrination that is occurring at Harmony Science Academy. Just a reminder of the battles ahead and who exactly we are fighting, many times it is actually Republicans. Texans this is why we fight against those Democrats and Rino Republicans in Austin who push to get their hands on our Rainy Day Fund. One of the most disheartening reports has been the connections of former executive director of the Republican Party and trusted advisor to President George W. Bush, Karen Hughes and her close ties to the Gulen/Cosmos Foundation’s Harmony Schools here in Texas. As you can hear in this video Ms. Hughes is very interested in promoting Harmony Science Charter Schools and accessing Texas tax dollars to create competition for public schools by funding the Gulen/Harmony charter schools. I attended the community art festival at the Indian Spring Park, and I know the dancers personally as I have attended Harmony Science Academy for several years. At that year my school only offered folk dance to the students in the 6th-8th grade. I watched the students practice many times, and each time they performed gracefully. The Turks would like to demonstrate their culture to the people watching, and the incorporation of the flag into the choreography has the sole purpose of demonstrating this culture. Turkish and American flags were hidden in their pockets to surprise the audience for the grand finale. One of the flags accidentally slipped out of a student’s pocket and, scared of messing up, the girls tried to sweep the flag out of the way so they didn’t have to step on it. They were not aware of the severity of the situation. They were focused on completing their dance as they had been practicing for months, and acted in complete innocence. As the girls left the stage, they quickly picked up the flag and left, as the next performance was about to begin. The community members did not rise to reject their “lack of respect”. In fact, hardly any community members were present. There were not as many members as I would have liked to see their grace.